When you’re creating a business, you will naturally have a lot on your plate. As 2013 come to a close, we’re counting down startups that’ve made a splash in using “social good” as their primary motivator. Flip through to be completely inspired by these entrepreneurs who’re not only giving you a service, they’re giving back. In August 2011, Rosenberg launched Do Good Buy Us with the intention of delivering well-made, healthy and sustainable products to an audience that craves a reprieve from mass-produced goods that carry ingredients like sodium oxide. This brand’s focus in 2014? Launching – and funding – several crowd commerce campaigns. Similar to a Kickstarter model, these campaigns use products to fund projects. A recent aim for a water well in Africa was funded by sales of more than 300 sustainably-made, BPA-free water bottles. Also in the New Year, Rosenberg’s team of five is continuing to partner with various organizations like the National Alzheimer’s Association, to reach a new audience and provide a product that’s not only stand out, but does good. With over 300 on-site vendors whose products range from jewelry to eco-friendly house slippers, they’re well on their way to being a go-to for quality products from even better vendors. Started by a nightclub promoter tired of an unfulfilling job, charity:water doesn’t spend money on paid advertising or marketing efforts, but raises millions annually to give 800 million people the resource they are so lacking: access to clean drinking water. According to Paull Young, director of digital at charity:water, the organization ensures that 100 percent of money raised goes directly to fund water efforts, primarily in Africa and southeast Asia. Content partnerships (with media sites such as Upworthy) are largely responsible for charity:water’s brand awareness. A video released on December 23 garnered 4K YouTube views in just three hours. Charity:water’s latest campaign for 2014 is focused around donating to the people of Malawi, Africa. Watch the video and be inspired to donate. Mike Smith’s a bit older than the age of your average college student, but he and two other cohorts from Syracuse University (Ian Dickerson and Frank Taylor) have already launched Centscere, a startup that takes your Facebook and Twitter activity and turns it into charitable bucks. Unlike the majority of donation-based sites, Centscere doesn’t target million dollar donors. What’s new in 2014? Centscere was recently accepted to Startup Labs starting January 2014, a program that takes startups and helps each build out its offering. Ninety five percent of the money donated to Centscere goes back to the intended charity, so ‘like’ and comment away. Soko is a Nairobi and NYC-based, women-founded and run social enterprise system, equipped with mobile technology in developing markets. Now connecting consumers to global markets in 2014, the team is excited about the possibility to contribute to a growing e-commerce platform that not only has stellar products, but can help women in Africa and third world countries fashion a better world for themselves. ShopSoko’s array of jewelry, from pendants to peacock-shaped earrings. You can’t go wrong when you do right, either in technology (Soko is constantly launching new online products to help make the e-commerce transition a smooth one for its vendors) or with this brand. We met the small-but-able team at Knoclothing at New York Tech Day back in April 2013, and we’re still continually impressed. The brand celebrated its third anniversary this winter and has also contributed more than 4,000 articles of clothing. The premise of the startup allows customers to donate the same article of clothing to someone in need whenever you make a purchase. In 2014, expect your faves in comfort and casual style, from feather grey hoodies to a little white dress. For the most part, it’s exactly that it sounds like. The grapes tell a story: a former Indiegogo project-gone-rogue, Wine 4 The World partners with top winemakers across America. Both winemaker and entrepreneur, in this case, exits each collaboration with a deeper connection to economic and personal development. In 2014, we predict even more wine-savvy consumers will take personal hold of this project, clamoring for better wine and more winemakers. All hail small (and local) business. Catchafire is probably our favorite startup in this lineup – the service enables you to connect with other entrepreneurs and local businesses you might not be connected to otherwise. But in addition to this, the platform – or “the skinny,” as its founders so deftly describe it – is the chance to sign up and volunteer your professional (or personal!) know-how to non-profits and small businesses that need it, but don’t exactly have a huge cashflow. For instance, if your local YMCA needs a WordPress ninja, you might be best suited for the job. Peruse the ‘Open Projects’ page to find gigs you’re interested in, volunteer to to take one on, and gain valuable experience for your professional portfolio in the process. The best part is that post-campaign, you’re able to see companies who’ve saved money through your efforts. It’s impossible to predict what’s forthcoming in 2014 since new projects are uploaded daily, but we can bet they’ll be just as inspiring and motivating as the plethora of offerings on-site now. You can’t talk back to your baked goods – or can you? 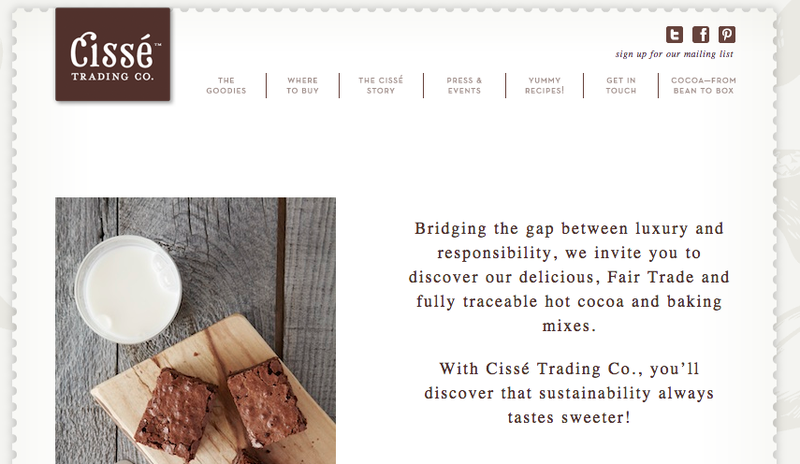 Cisse Trading’s aim is simple: buy Fair Trade noms, from cookies to cocoa, on-site or in grocers from main to Virginia, where you’re immediately giving back to the Dominican Republic farmers who grow ‘em. But even better: connect with these infamous cocoa farmers by scanning the QR code on the back of each package to write a message. Follow @CisseTradingCo on Twitter to see what’s cooking for 2014.